When 20th Century Fox unveiled its main villain in the upcoming X-Men: Apocalypse film, fans were skeptical, if not outright disappointed. 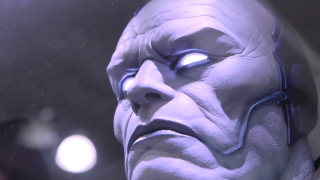 En Sabah Nur - AKA Apocalypse - was tinted purple thanks to the reveal photo's lighting, and his costume didn't quite match up with the look Marvel readers had become accustomed to over the years. As it turns out, an appearance more in-line with Apocalypse's comic book version was almost a reality, thanks to a man named Jose Fernandez. Fernandez and his company Ironhead Studio may not ring any bells, but odds are you've enjoyed some of their work over the past decade. His costume work has been seen in films like the Sam Raimi Spider-Man trilogy, Batman v Superman, and the upcoming Captain America: Civil War - which Ironhead created the oh-so-cool Black Panther costume for. Fernandez was also very nearly responsible for Apocalypse, but, as he explained in an interview with Tested at Monsterpalooza, 20th Century Fox ended up going with a different company. Feeling disappointed with the villain's reveal, Fernandez decided to see what he could do. Thus, he created the face you see above using a life-size bust of actor Oscar Isaac. And while we won't be seeing it on the big screen, at least we can appreciate his efforts and give him credit for all the ways he's helped bring our favorite heroes (and villains) to life. Feel free to watch the whole interview below, or skip to 10:30 to hear about the process behind Fernandez's Apocalypse. Directed by Bryan Singer and starring James McAvoy, Michael Fassbender, Oscar Isaac, Jennifer Lawrence, Olivia Munn, Tye Sheridan, Alexandra Shipp, Sophie Turner, Rose Byrne, Nicholas Hoult, and Hugh Jackman, X-Men: Apocalypse will be released in UK cinemas on May 18, 2016 before making its way to US theatres on May 27, 2016.